I’m home from Romantic Times in Kansas City. Sorry for the blog silence this past week but I was insanely busy and there wasn’t wireless internet at the hotel. It was easier to do some tweeting and posting pix on Facebook via my phone. So stop over on FB if you’d like to see some pictures of the giant book fair or my costumes. It was a fantastic trip. I got to meet Laura Kinsale and managed to talk like a reasonable human being until she asked if I had a card. Then I turned into a blushing stammering idiot (but I did give her my card). I also met Lauren Dane, Jaci Burton, and Shannon Stacey. At once! It was amazing. I had dinner with my editor, Tera. We had a blast at the Carina author get-together (AND THEN SOME!!!! ), the Here Be Magic breakfast, and the Carina cocktail party. Ann and I successfully room-mated for the second year in a row. And we’re even still friends! I gave away lots of masks, tons of pens, and even managed to sell a few books. 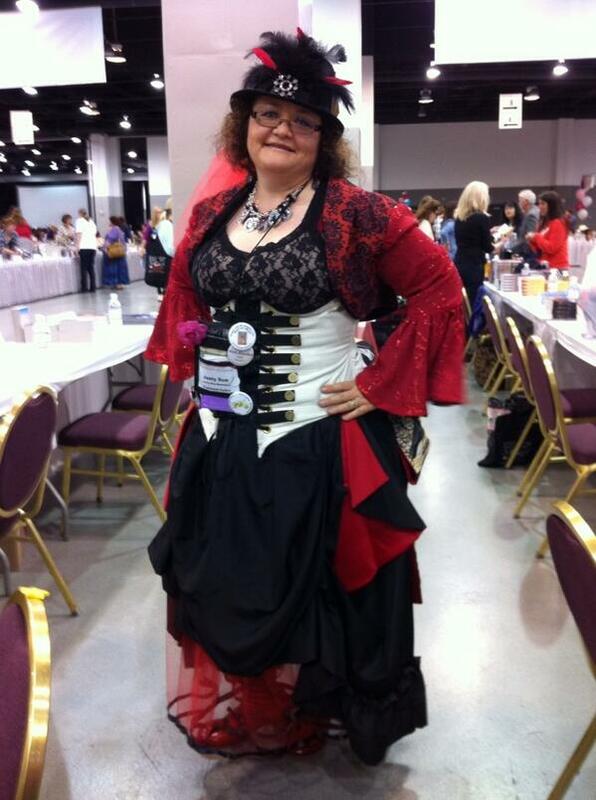 I loved meeting readers and fans and bloggers alike. 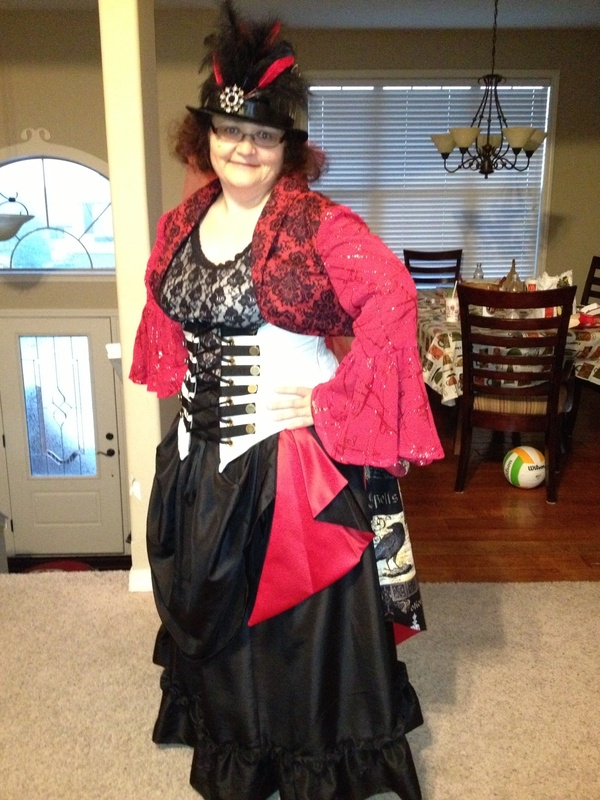 I wore my costume several times and even participated in two contests. I walked at least a mile every single day, most days 2-3 miles. Food was at times a problem — dinner at 9 or even 10 PM, no lunch, etc. But I totally fell in love with Panera’s. What a lifesaver after the crappy $20+ breakfast at the hotel the first day. I came home with two tote bags full of books. Not as many as last year, but still a ton. I also have a huge tote full of promo swag that I’ll be setting up as giveaways here on the blog. Yes, I fully intend to share the wealth of goodies! I’m in full panic frenzy mode. Tomorrow’s my last day at the Evil Day Job until May 7th and I’ve got soooo much to do! We’re in the middle of a large project with a hard deadline, and I’ve got to try and come up with enough stuff for a very efficient programmer to work on while I’m out. She whizzed through all the stuff I did this week already so I have absolutely NO CUSHION. I still have to finish gluing my mask promo items. We only have about 25 or so done. I still have to find more clothes to wear during the day, although I’m covered for the nightly events for the most part. The dress I bought for the award ceremony is gonna be snug. Thank God for Spanx. I want to get at least one more pair of black jeans. Maybe another shirt or two. I’ll see what I can find this weekend, but I’ve struck out on my favorite brand of jeans once already. Granny brought by the cute little vest thing to wear beneath my corset. The only problem I see with it: it’s extremely short. I don’t know how comfortable it’ll be if I’m fighting it all the time, but I suppose under the tight corset it probably won’t go anywhere! I’m breaking in some new boots to wear during the day. Yeah, not my brightest idea, but I fell in love with these red Dr. Martens. In all my internet reading, I found that Dr. Martens are notoriously tough to break in, but these aren’t bad at all. Of course I am wearing two pairs of socks with them… but I’ve been able to wear them all day without issue. Will I be able to walk all around KC next week in them without crippling myself? Today I drove back up to Granny’s (my Mom) and helped put the finishing touches on the outfits. I. Am. Amazed. My Mom did such an incredible job! The pieces are gorgeous. They mix and match, with interchangeable bustles and boleros. Here are a few pictures. Warning: sans makeup and my hair is messy. The fancy beaded corset is harder to put on, so I stuck with just the white one for now. This one was taken in Mom’s sewing room. The bustle is detachable, simply buttoning onto the black taffeta skirt’s waistband. I thought this would be my favorite bolero, but I actually like the red one (below) better. 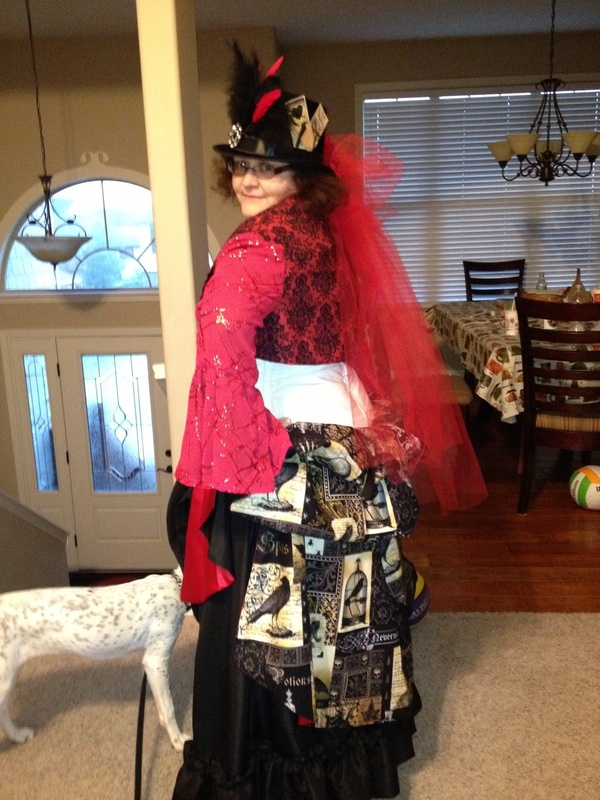 It might be hard to tell what’s in the pattern on the bustle, but it’s black feathers, skulls, spider webs, etc. Wicked cool and definitely not “usual” Victorian wear! This one was taken once I got home. This bustle is much more complicated and ties onto loops sewn into the back of the skirt AND buttons onto the waistband. I’m starting to understand why ladies had ladies’ maids, because MAN it’s going to be hard to dress myself at RT. 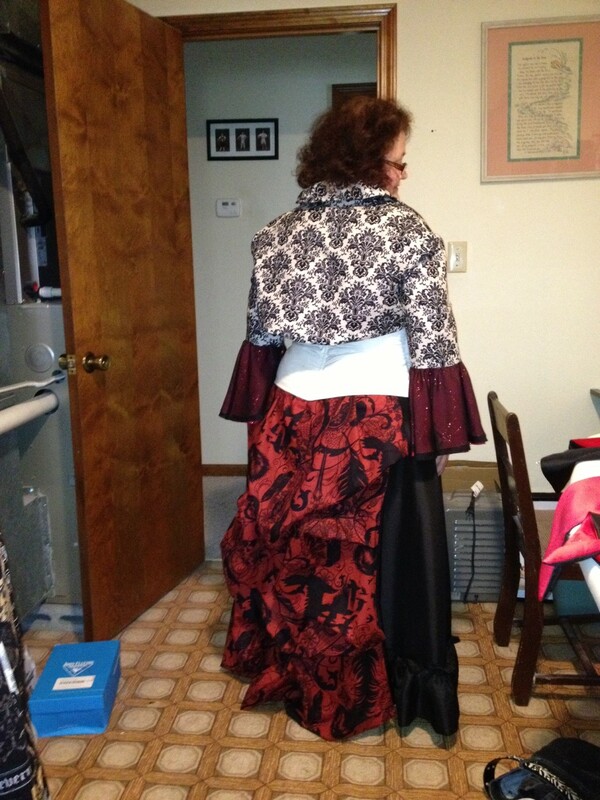 I have to tie the bustle on first, but leave one side undone so I can slip into the skirt. Then tie and button it once on. It’s almost as hard as fastening the busk on the other corset! The monsters helped me make the hat. Here’s the same one from the front. That apron thing beneath the corset is also detachable, so I can choose to wear it with either bustle. I adore the flash of red satin in the cascade! I’m still working on finding the right shirt to wear beneath the corset. This cami works, but the straps are a little too big and I’ll be constantly checking to make sure nothing’s sagging out the side. The pattern had a lined vest that looked a lot like this cami, but Mom was having problems with it. I told her not to worry about it – the show stoppers are done and are gorgeous. I can find something to wear underneath!